LCHF P I Z Z A !!! Okay, I have to admit, although I never ate pizza regularly, it was always nice once in a while to have a thin-crust crispy pizza, loaded with bacon, chives, haloumi, caramelised onion, garlic & banana. Yummy! For some, that might sound completely gross. But that’s the beauty of pizza, you create your own craving satisfaction! BUT the weird part is, about two weeks ago, I was naughty and had a pizza. ‘Lo & behold, I hated every bite of it. It felt like I was eating cardboard! The only rationale I could think of, was that my body had adapted and was so used to LCHF, that bringing back gluten was like a foreign nasty substance in my body. And my gut did not react very well having it in my stomach! Thus the moral of my story, was how could I create a LCHF pizza, my body & converted taste buds would accept…..there are so many LCHF pizza recipes that I’ve seen, that I’ve decided that I am going to try a few of them & share with you my experiences. And my first attempt, was a winner! It was tasty & held its shape well. But you will not get the crispiness you have from a regular pizza, and the taste will be different but in a good healthy way! And best of all, it’s quick & easy to make & can be frozen. Preheat oven around 190-200 degrees celsius. Grease/non-stick spray a baking tray. I used baking paper that I non-stick sprayed, but this is up to you. In a bowl (or food processor) mix all the ingredients together. Make sure it’s not too thin, since it will break (won’t be able to lift) or not too thick (won’t cook through & mixture will be soggy). Bake in the oven for 15minutes (even up to 20minutes, if you want & the crust isn’t getting burnt). Take out the oven, and add the tomato paste or sauce, your cheese/s and any toppings you enjoy, like bacon (pre cooked), mushrooms, artichokes, onion etc. Grill on a high heat, until cheese is melted. This recipe reheats nicely, and can be held in your hand, if cut into slices. Pizza crusts can be frozen after the initial baking & defrosted when used later, then adding the toppings. 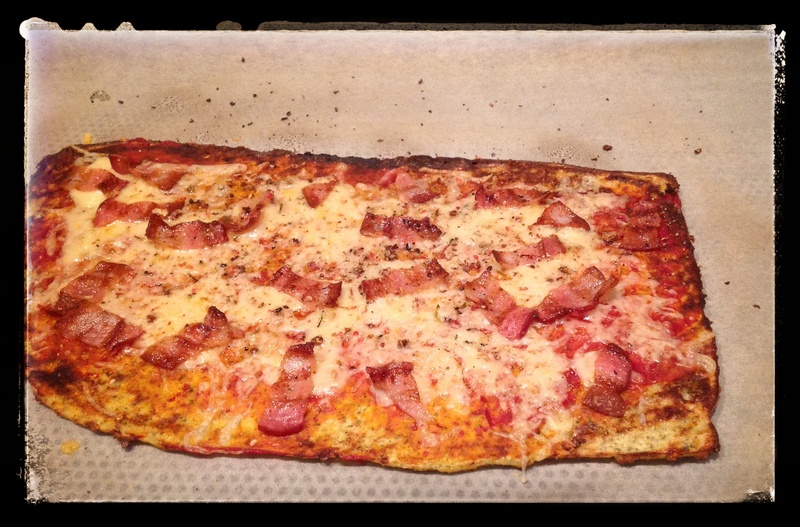 This entry was posted in lchf, LCHF recipes, mains and tagged atkins pizza, banting pizza, gluten free pizza, LCHF pizza by angelb38. Bookmark the permalink.